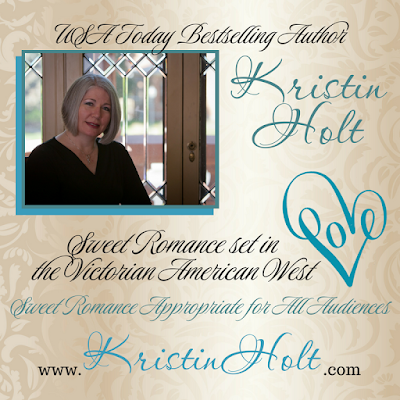 I'm fascinated by everyday life in America's Victorian Era. Little elements that everyone in 1877, for example, knew as commonly as we know what it means to "click on an icon". Useless, as far as foreign phrases go, to traveler across the American plains in the latter half of the nineteenth century--and most two-year-olds today know how to play games on an iPad. Times change. That precise element--everything old is new again--contributes to the fascination readers find in books set in the American Old West. How did people find out a train's schedule? How much did passage cost? When did trains with vestibule (walking pathways) connections become commonplace? How were cars heated in the winter? What did travelers eat? 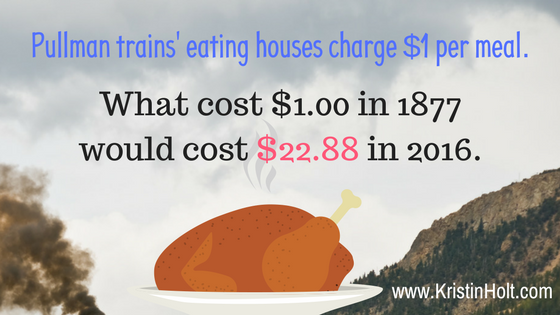 You might be familiar with Harvey Houses or Station Houses (eateries along the rail at stops). I've always read that outside of Harvey's Houses, created to fill that very need in the market, station restaurants served atrocious food. Poor quality, often spoiled, inedible food. 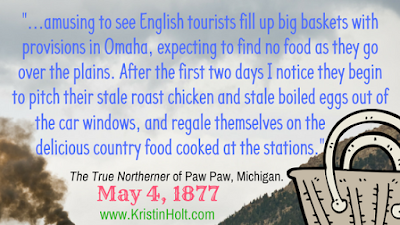 To my delight and surprise, I came across this newspaper article from The True Northerner of Paw Paw, Michigan on May 4, 1877, wherein the unnamed newspaper columnist tells the curious reader how emigrants live on the trains, what necessities cost, and that mothers traveling with children launder clothing and cook (can you imagine?) on the moving train. The writer was "astonished at the supply and cheapness (frequently used in a positive light, a.k.a. "affordable", "excellent price", in the 19th century) of the food along the road." The prices attached to train fare and foods purchased may not seem irrational to you or me. 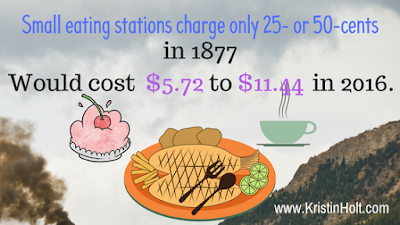 We dine out and easily spend within the range charged at the finer Pullman eating houses. I feel compassion, though, for emigrants who sold everything they own in order to afford passage from Europe aboard a ship, then rail fare (expensive compared to airfare today!). 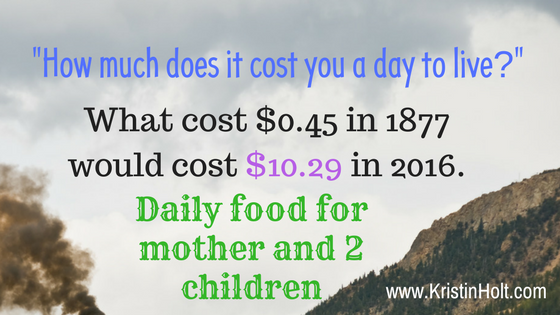 Simply feeding each member of the family, meeting daily needs, and having anything leftover with which to start new in America must have been difficult. 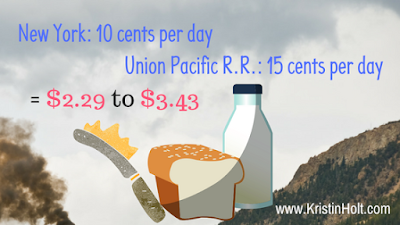 No wonder emigrants cooked what they could aboard the train (atop the cast-iron stove used in winter to heat the car, I assume), purchased ready-to-eat foods along the way (bread, butter, milk), and thereby decreased expenses. Many emigrants suffered hunger, deprivation, and fear, exacerbated by language barriers. This article showed a lighter side to my overall impression of the emigrant's plight. I guess if newcomers to America had enough resources to travel by train, life may have been as simple and affordable and easy as this newspaper article makes it seem. 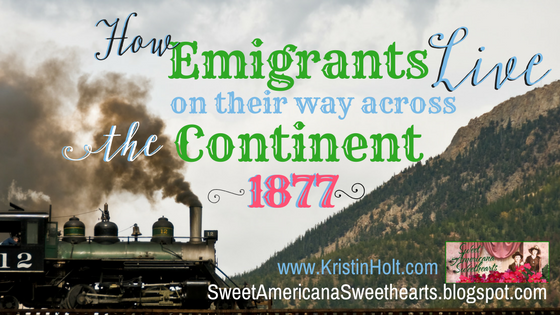 Have you read a novel or novella that contains emigrants traveling by train toward their new home in western United States (or Territories) in the nineteenth century? 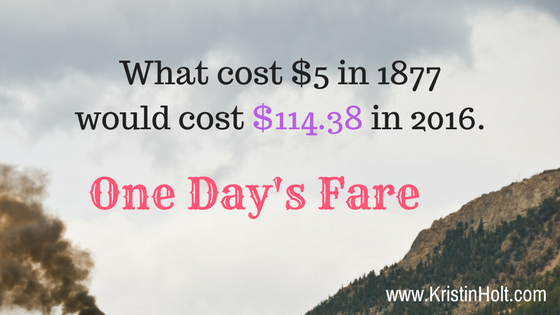 How does this article shed light on your understanding of nineteenth century train travel? Please scroll down and reply. I'd love to hear from you! I wrote an article about luxury train travel--the opposite end of the spectrum from emigrant train travel. 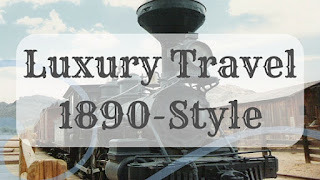 This post shares many vintage photographs of luxury train cars. 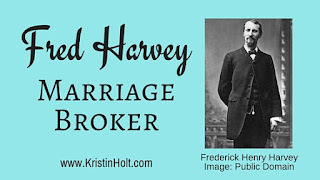 Want to know more about Fred Harvey (of the famous "Harvey House")? Thank you, Doris! I wholeheartedly agree... and can only say "ditto!" I love posts like this. The information is so helpful when trying to write accurate information into a historical story. Thanks for sharing. Thank you for your kind words, Robyn. I'm glad you found this post helpful and interesting. Happy Writing! 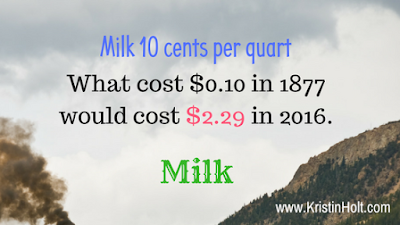 I always wonder about the cost of things as I write my historicals. And just recently (yesterday!) I was traveling across country with my husband and wondering how in the world pioneer women handled things like dirty diapers, going to the bathroom when there wasn't a tree to hide behind, and things like that. We sure are spoiled now! Indeed! Twenty-first century women have it (comparatively) easy. I know the basics behind my emigrant ancestors' journeys from Europe, and I'm SO grateful that responsibility didn't fall to ME. Fascinating to read about... not sure I could do it. =) Thanks for stopping by and commenting, Kathryn!